Tonight, the Houston Astros have a chance to make history when they play the Los Angeles Dodgers in game 7 of the World Series. This is undoubtedly the greatest squad in the Houston franchise’s 52 years of existence, and not just because of their 101 wins during the regular season and the fact that they are the first Astros team to win a world series game. The 2017 team is the best because they have served as a beacon of hope for the city of Houston, especially in the aftermath of Hurricane Harvey. Hitting Texas in late August and early September over four days, Hurricane Harvey unleashed a torrential amount of rain greater than 60 inches in some places, killing 88 people, displacing 30,000. Harvey caused an estimated $198 billion in damages, making it the costliest hurricane ever in the United States. After the floodwaters subsided and people began to assess damages to and restore and repair their homes and businesses, it was difficult for folks to find something to be happy about and look forward to while trying to return to their normal routines of everyday life. For the people of Houston, the Astros made that process a little easier. When the hurricane hit, the Astros had been struggling. The team went 20-24 after the all-star break, and at one point had lost 10 out of 13 games in the month of August. Upon returning to Houston, the players took time out of their busy schedule to meet with fans and help those that had been displaced from their homes. They witnessed first-hand the devastation the disaster caused to so many good people, and they took it to heart. After acquiring pitcher Justin Verlander through a trade with the Detroit Tigers just minutes before the trade deadline on August 31st, the team went on a 22-8 tear to clinch the American League West Division. Playing with "Houston Strong" on their chests and the people of Houston in their hearts, the Astros successfully battled all the way through the playoffs and continued on through one of the most entertaining World Series ever to have the chance to earn history in game 7 tonight against the Dodgers. Whether it's Jose Altuve, George Springer, Carlos Correa, Alex Bregman, or anyone else that puts on an Astros uniform and takes the field, you can tell from the emotions on their faces every night how badly they want to win and give the people of Houston a reason to celebrate. 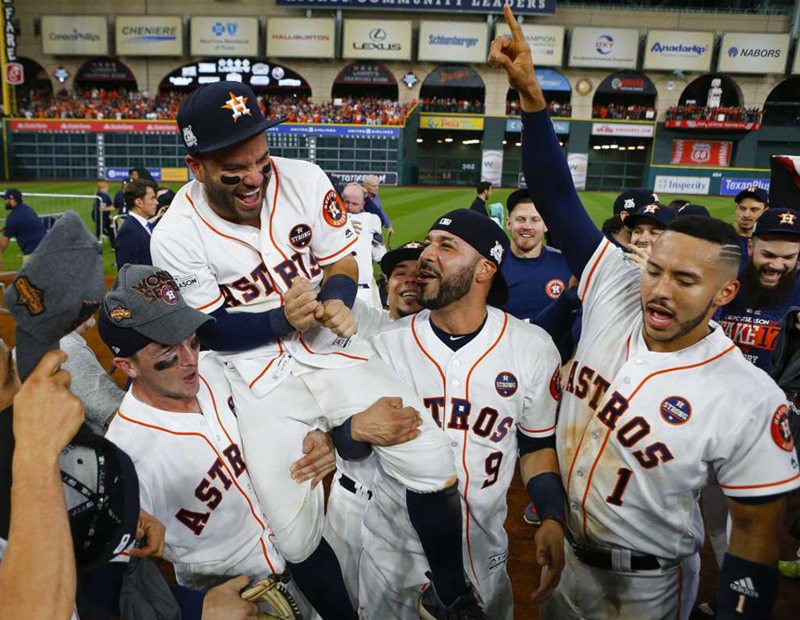 Through the passion they display with their hard work and triumph in the face of adversity, the Astros represent the indefatigable willpower of the city that was knocked off its feet but has gotten right back up again. When they win tonight, the Astros will give their fans something to be proud of during hard times. Their trending hashtagable motto is something that Texans agree upon and understand. Nothing in this life worth having will be handed to you. If you want to be great and make it, you’ve got to #EarnHistory.